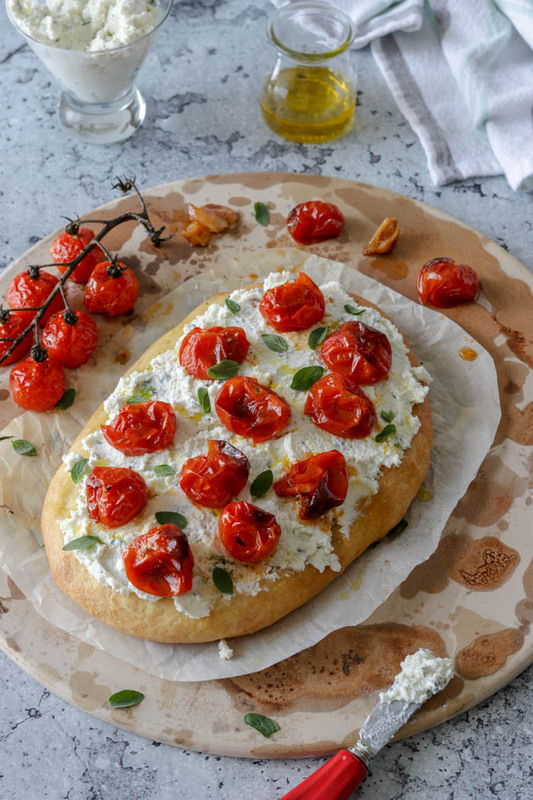 This Herbed Ricotta and Roasted Tomato Focaccia makes a truly satisfying lunch with a side salad. It can also be enjoyed as a delicious appetizer before your main meal. I’ve been loving lately these wonderfully sweet cherry tomatoes made even more so by oven roasting them till they’re slightly charred and pop open. The roasted tomatoes ooze out the most sweetest concentrated juices with their wonderful aromas permeating the air. There are so many ways to use these roasted jewels as some of my Instagram friends can attest! You can snack on them as they are with some crusty Italian bread or tossed with your favourite pasta. Some suggested slow roasting the tomatoes, storing them in jars filled with oil and kept in the refrigerator up to a month. Usually, I simply top the roasted cheery tomatoes over ciabatta bread which makes a crowd pleasing appetizer. As seen with this Roasted Cherry Tomato Ricotta Bruschetta. I’ve decided to switch it up today by baking some fresh focaccia bread which is essentially a flatbread and not difficult to put together. The flatbread with its soft, airy textures and crusty outer layers is then slathered with a a creamy herbed ricotta mixture. I must say its truly mouthwatering on its own but we’re going for the “swoon factor” here! What better way to do so then topping the flatbread with some juicy oven roasted cherry tomatoes! Oozing out all their caramelized goodness and ready to be sopped up…yummy! You can enjoy the flatbreads with a side salad and call it a meal. We especially love them sliced into wedges and served as appetizers. You can also make and bake the flatbreads ahead and freeze them till ready to use. This way you’ll have a yummy flatbread to enjoy at a moments notice! Heat 2 cups of water with 4 tablespoons of olive oil in the microwave until lukewarm. In a large bowl combine 3 cups of flour, yeast, salt, sugar and stir well. Stir the warm liquids into the flour mixture with a wooden spoon, mixing well. Stir in another cup of flour until combined. Transfer the dough to a well floured work surface and knead for a few minutes while working in the remaining cup of flour a bit at a time, just until the dough is soft and smooth. Grease a large bowl with oil and place your pizza dough in the greased bowl while turning the dough over to grease all over. Cover the bowl with a dish towel and set aside to rise for 60 minutes or until doubled in size. Once the dough has doubled in size, transfer to a floured work surface and divide into 4 equal portions. Transfer the portions to the prepared baking sheets, placing 2 on each sheet allowing enough space between the 2 portions. Using your hands, push the dough towards the edges of the baking sheet while shaping it roughly to a 6x8 rectangle. Cover with a clean dishcloth and allow to rest for 30 minutes. 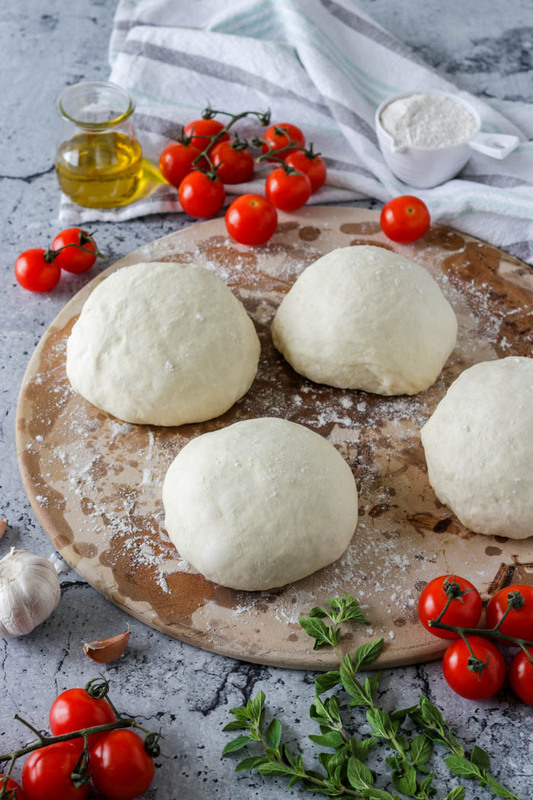 Uncover the focaccia dough and using your fingers press down to form indentations. 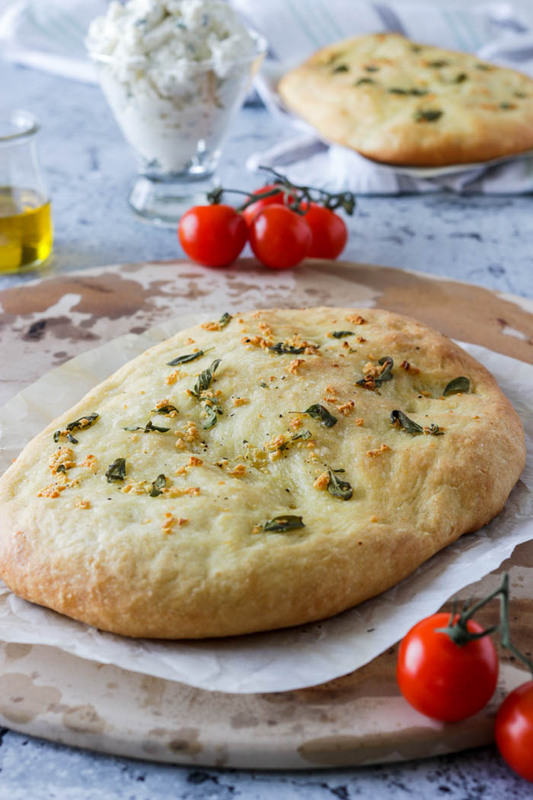 Stir together 4 tablespoons of olive oil with the minced garlic, oregano and brush over the surface of the focaccia. Bake for 20 to 25 minutes or until golden brown. Place the cherry tomatoes on a parchment lined baking sheet. Scatter with the smashed garlic, tuck in the sprigs of oregano, a sprinkle of salt and pepper and drizzle with some olive oil. Roast in preheated oven at 400 degrees F for about 30 minutes to 35 minutes. Combine the ricotta, oregano, thyme wth salt and pepper in a bowl and stir well. Slather the herbed ricotta mixture over the baked focaccia with equal portions. Equally top with the oven roasted tomatoes. Garnish with extra oregano, a drizzle of extra virgin olive oil. Roasted Cherry Tomato Ricotta Bruschetta are perfect for days when gardens or even farmer’s markets are overflowing with bright and colorful cherry tomatoes. They are little pearly jewels of a thriving garden, lovingly tended by caring hands. Every time I come across them they evoke many memories of my little ones, gleefully gorging on cherry tomatoes in their nonno’s garden. These little bite sized fruit are so versatile and should really be a staple ingredient in every kitchen. Thankfully they’re available year round, complimenting many dishes with their exquisite miniature shape and various bright colors. While wonderful when eaten fresh plucked straight off their vine, when roasted, their natural concentrated sweetness is enhanced which adds a whole other level of goodness to a dish! Not much fuss is required to draw out their natural sweetness. Usually a light drizzle of olive oil with some fine sea salt, freshly cracked black pepper and your favorite herb tossed with smashed plump garlic cloves will do the trick! You will so enjoy the aromas permeating your kitchen once their roasted. At this point there is really so much more you can do with them, such as tossing the roasted tomatoes over some cooked pasted or even using them as a pizza topping. Or try roasting and then freezing large batches to add a little bit of summer to your Fall or Winter soups. However, we are technically still in the lazy days of summer stage and so I’ve kept it simple for you. I’ve grilled a half sized ciabatta bread, perfumed it by rubbing a clove of garlic over the slices. I then slathered some creamy ricotta cheese and crowned the breads with the oven roasted cherry tomatoes. It’s so easy and yummy that you’ll be hard pressed not to share with family! You can cut each ciabatta slice in wedges and serve as appetizers with a first course meal but I could probably snack on these all day long. 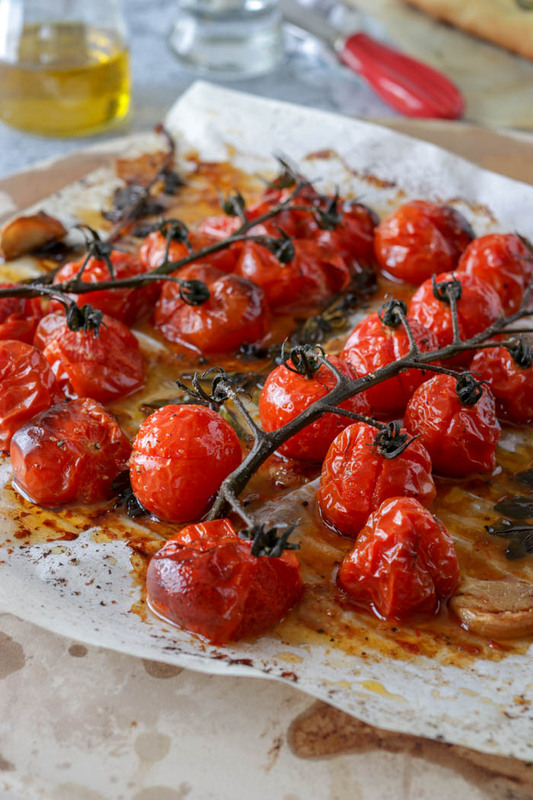 Although these oven roasted tomato slices are fabulous on their own, you can elevate the taste by drizzling some good quality extra virgin olive oil over the slices. Alternately, you can sprinkle the best balsamic vinegar you can afford over these delectable slices. Or better yet, top with a small splash of balsamic reduction for a special appeal! Remember though, a little goes a long way! 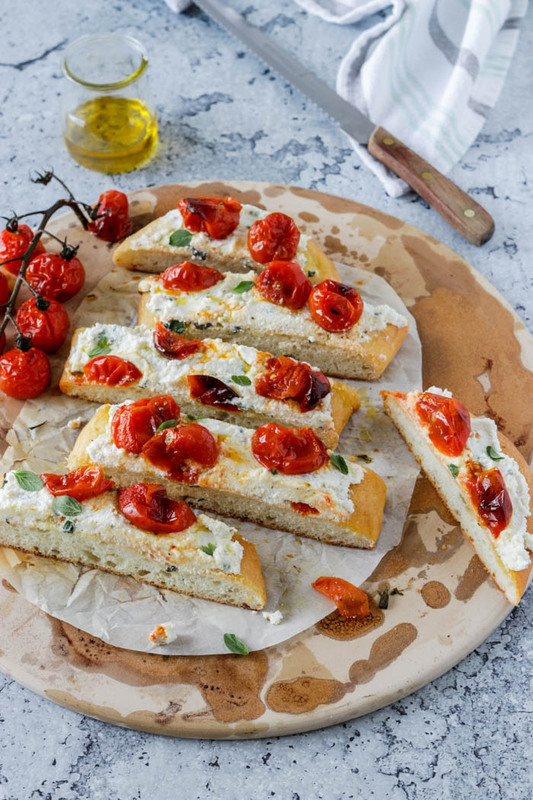 Grilled garlic bread slathered with creamy ricotta and piled with sweet and juicy oven roasted tomatoes. Line a large cookie sheet with parchment paper and set aside. In a medium sized bowl, toss together the cherry tomatoes with smashed garlic, salt, pepper and olive oil. Spread the cherry tomato mixture onto the prepared cookie sheet. Nestle the sprigs of oregano between the cherry tomatoes. Bake in preheated oven for 30 to 35 minutes. Meanwhile, brush 1 tablespoon of olive oil over the sliced ciabatta bread. Preheat a grill pan and place the bread cut side down onto the pan and toast till there are deep golden brown grill marks. Rub a garlic clove over the sliced grilled bread. Divide the ricotta onto the 2 slices of bread while spreading evenly. Top with the roasted cherry tomatoes and garnish with some fresh oregano. Drizzle some good quality extra virgin olive oil over the bruschetta then slice into wedges and serve. Alternately, you can drizzle a good quality balsamic vinegar or a balsamic reduction over the bruschetta slices. These vegan eggplant pockets could not be more simple to make and will surely have you doubling the recipe because they are devoured ever so quickly. They can be served elegantly as a side dish on a bed of arugula or baby romaine leaves and they make a delicious addition to any antipasto platter. 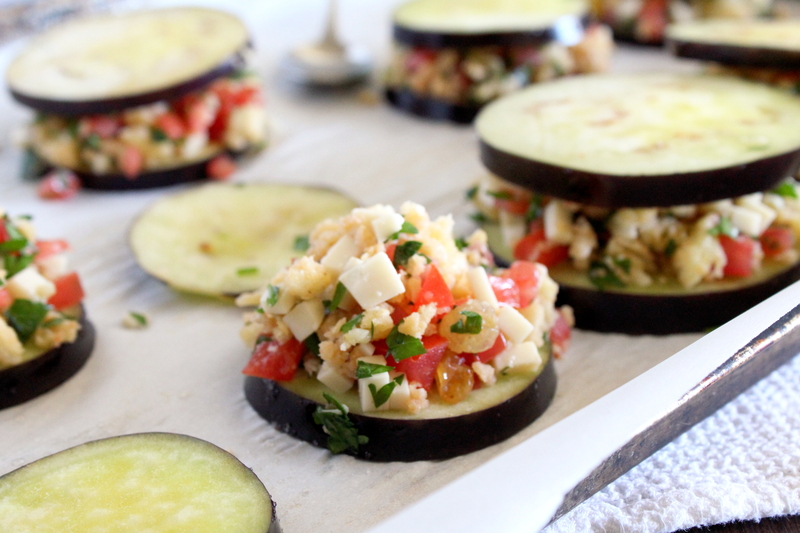 A wonderful twist on a reverse sandwich with the bread tucked in between the eggplant slices. I am by no means an expert on vegan meals as I very much enjoy poultry, fish and occasionally beef dishes. Nor would I ever be able to give it up entirely. My daughter however, has been doing a 30 day vegan challenge and so far she is enjoying it. My challenge was in finding a vegan cheese which would greatly resemble or mimic the sharpness of a good quality Parmesan cheese, which I have always used in this recipe. I believe, I may have burnt a hole in the floor of the organic and vegan dairy section of my favorite grocery store. That is how long I stayed rooted in the same spot, reading and rechecking the list of ingredients on the various vegan cheeses. In conclusion, there is no vegan replacement for Parmesan cheese, the king of all cheeses! I did however come across an organic, vegan mozzarella flavored cheese, which worked beautifully in this recipe and imparted a creamy taste and texture that was simply irresistible. A little note to help along the way…have the stuffing ready before cutting the eggplant since the flesh quickly discolors. A little fun fact…bigger is not always better! Smaller eggplants are best. The full sized eggplants tend to have hard seeds and can be bitter, so do look for smooth-skinned ones and avoid any that have soft brown spots. These little vegan pockets also make a healthy and fun afternoon snack for all kids who come barging in with a rumbling tummy after school! If anyone knows of a good vegan substitution for Parmesan cheese, I would love to hear from you…simply leave me a comment! 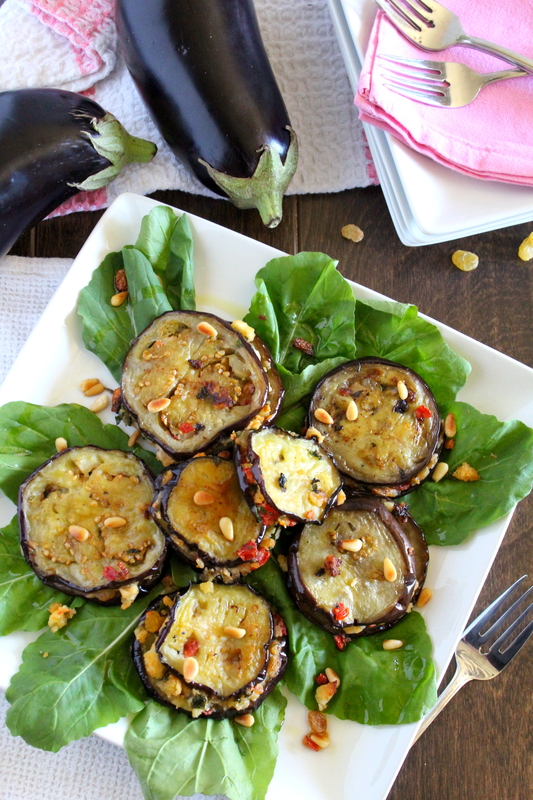 These vegan eggplant pockets make an easy and delicious side dish. They can also be served as a first coarse meal over a bed of arugula or baby romaine. In a medium size bowl, combine the bread crumbs, cheese, tomato, 2 tablespoons of extra-virgin olive oil, parsley, garlic, raisins, pine nuts and 1/4 teaspoon of salt and pepper. Set aside. Brush both sides of the eggplant slices with the remaining extra-virgin olive oil and sprinkle both sides with the remaining salt. 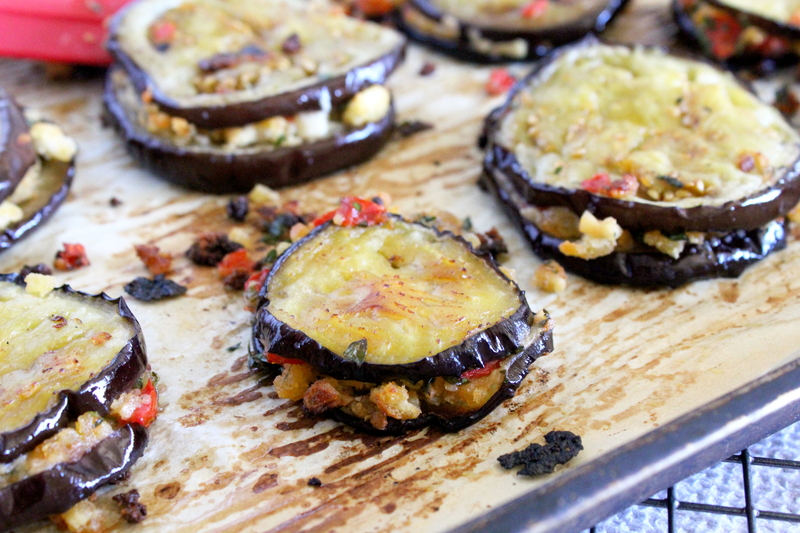 Place half of the eggplant slices on the prepared baking sheet. 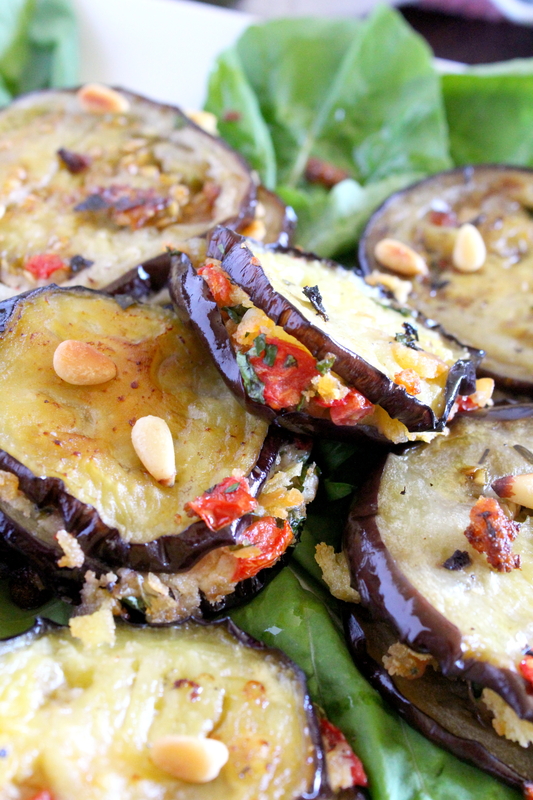 Spoon the bread mixture evenly over the slices and top with the remaining eggplant slices. Bake in 450*F degree oven for about 20 to 30 minutes, turning once or until the slices are a light golden brown on each side. This amazingly super easy crostini will wow your guests from the very first bite. It can be prepared up to four hours in advance by simply covering the crostini separately from the pepper mixture. This was a task usually delegated to my children whenever we had company, allowing me time to put the finishing touches to the rest of our meal. Just remember, if you are preparing in advance, add the salt and pepper just before serving as the salt will whittle down the arugula. Rosemary Oil: In a small frying pan heat the extra-virgin olive oil with the rosemary over medium heat for about 3 minutes. The rosemary will start to turn greyish. Place the bread slices on a baking sheet and brush the tops with the rosemary oil. Place under the broil for about 1 minute or just until the bread turns a nice golden brown. Let cool while you toss the other ingredients. In a bowl, combine the roasted red pepper, garlic, extra-virgin olive oil, salt and pepper. Gently toss together. Spread the ricotta over each crostini and then top with the pepper mixture. Makes 12 yummy crostini pieces.